Includes all previously released DLC for the console versions (including additional outfits, weapons, and cases such as “Nicholson Electroplating”, “Reefer Madness”, “Naked City”, “Slip of the Tongue”, “Consul’s Car” and more) and makes them available to players from the start. Amid the post-war boom of Hollywood\'s Golden Age, Cole Phelps is an LAPD detective thrown headfirst into a city drowning in its own success. Corruption is rampant, the drug trade is exploding, and murder rates are at an all-time high. In his fight to climb the ranks and do what\'s right, Phelps must unravel the truth behind a string of arson attacks, racketeering conspiracies and brutal murders, battling the L.A. underworld and even members of his own department to uncover a secret that could shake the city to its rotten core. Tired of being a thug in open worlds? Here is your chance! 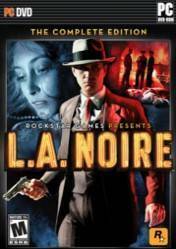 In L.A. Noire, participate to a "Noir" adventure. You will be set in old Los Angeles after the second world war. Lots of retro weapons and cars at your disposition, reminding us of the Mafia games. Only this time, you are the good guy. Solving cases, from small to overly complicated and having to deal with corruption. You will not know who to trust, except by trying to read the facial expression of the people you interrogate. The developpers did a great job at it and it was acclaimed when it was out as the top of the facial expressions we could get. Of course, sometime it's not easy to read if the person is lying or not, as the actors were "acting". You'll have to go with your detective guts. A very nice game to play with your significant other, for the style, pace, details as your SO is half watching while doing something else. Game could be more optimized on PC though. Thus, it's only 4 out of 5 stars for me.